There is a lot to prepare for as you get ready for a week away from the daily grind. There's luggage to pack, travel insurance to buy, and prepping your home so it's protected while you're away. Every year, thousands of Canadians weary of winter set their sights on the upcoming March Break holiday. Last year, Toronto's Pearson Airport estimated they'd see 130,000 travellers on the Friday prior to March Break; well over what they see on a typical day. You can expect all airports across the country to be busier than normal. Are you ready for the crowds? How about going through security clearance? 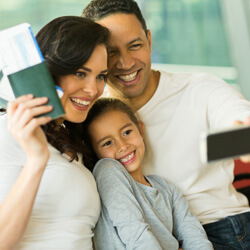 Every passenger must pass through security clearance before embarking on their trip, but the process can be involved, and it pays to be prepared. Breeze through security, stress-free, by keeping in mind these tips from the Canadian Air Transport Security Authority (CATSA). There will be crowds, and the airport will be busier than normal. Generally, it's recommended that you arrive at the airport two hours before a domestic flight, and three hours prior to your flight if you'll be leaving the country. If you want to pack any liquids, aerosols or gels into your carry-on luggage there are restrictions. These products must be in a container no larger than 100 ml, and can all fit into a clear, closed and re-sealable plastic bag with a capacity of no more than 1 litre. Each passenger is allowed one, clear re-sealable plastic bag. It's a common misconception that you're not allowed to bring food with you. The truth is, you are allowed to bring solid food items such as sandwiches, cookies, fresh fruit and granola bars in your carry-on bag to eat on the plane. However, it's best to eat it all before landing. If you want to bring non-solid food, like yogurt, pudding or peanut butter, these items will have to adhere to the 100 ml rule above. Travelling with a child under two? Essentials like baby food, milk, formula, water and juice are exempt from the 100 ml limit; however, they must be declared when going through the screening process. These items should be packed in your carry-on for easy access. Pack toys for your children in your carry-on, but leave toys that look like weapons at home. It's generally recommended that you keep fragile or expensive items with you in your carry-on baggage. Electronics like cell phones, MP3 players, e-readers, handheld gaming devices and tablets do not typically need to be removed from bags when going through the security checkpoint; however, laptops do need to be unpacked and placed in a bin. Although permitted on board, air carriers may vary in when, or if, they can be used. Limit the jewelry you wear to the basics: earrings, watches and rings. Remove hidden body piercings before you leave for the airport. Dress comfortably with easy-to-remove outwear, jackets and belts. When you're away from home, even a small accident or sudden illness can become a big medical expense. Compare travel insurance quotes and policies today, before you embark on your adventure.